Dispassionate discourse with Nazis is not only pointless, but actively dangerous. In the cosmic calendar of resistance, this may well be the Era of the Punched Nazi. This fact has caused some consternation and hand-wringing among those who see Nazis as perfect foils for their ideological posturing rather than very real genocidal extremists with a long and bloody track record. For the mainline liberals and conservatives who lament the punching of Richard Spencer, the young white supremacist activist who coined the term “alt-right,” Nazism remains a theoretical construct, an “idea” that can be debated and defeated without a shot being fired in anger. For the rest of us — for many Jews, for ethnic and religious minorities, for queer people — Nazism is an empirical fact with the solidity of iron roads leading to walled death camps. The camps are Nazism’s endpoint; it is what Nazism is for. Nazism serves as a refuge for whites dislocated by mass society and modernity, who seek someone to blame for their anomic dread. With that in mind, we must be very explicit about what Nazism’s relationship to democracy must be, and refuse dangerous, whitewashing euphemisms when discussing it (e.g. “you support punching someone who disagrees with you”). Such generalizing language is intellectually lazy at the best of times; here it is outright deadly. Yes, it could be said that I “disagree” with Spencer that a genocide of Black Americans is desirable, but I believe he should be punched because of the very real risk that he could galvanize such an event into actually happening. This is a fear supported by the tremendous weight of our history, and by the fact that we had to fight the bloodiest war of our species’ existence the last time Nazism came into conflict with modern democracy. To call this a “disagreement” is an unspeakable slight against millions of dead. To be blunt: Nazism is democracy’s anti-matter. There is nothing about the ideology or its practice that is anything but corrosive to democratic institutions. Fascism is a cancer that turns democracy against itself unto death. There is no reasoning with it. It was specifically engineered to attack the weaknesses of democracy and use them to bring down the entire system, arrogating a right to free speech for itself just long enough to take power and wrench it away from everyone else. Simply allowing Nazis onto a stage, as the BBC did when it let British National Party leader Nick Griffin sit and debate with political luminaries on its Question Time program, is to give them an invaluable moral victory. Like creationists who debate evolutionary biologists, the former benefit mightily from the prestige of the latter. In using this tactic, Nazis abuse the democratic forum to illegitimately lend credence to something that is otherwise indefensible, the equality of the stage giving the unforgivable appearance of “two sides” to a position that is anathema to public decency. This is not because Nazis love democracy or free speech, but because they know how to use this strategy to unravel them. But is it enough to say that we must meet Nazism with force because it is so terrible? It should be, morally. I would, however, add that there’s room to consider why force, specifically, is a necessary tool in these extreme times. There is a reason that it works against Nazis, adding weight to the argument that they are a special case where a normal ethic of nonviolence should be suspended. The goals of Nazism have not changed, but some of its window dressing has. As he was being punched, Richard Spencer was showing off a lapel pin of Pepe, a cartoon character appropriated by extreme right and Nazi 4channers in their reactionary campaigns, which ultimately featured in many pro-Trump memes, some of which were retweeted by the man himself. The new exponents of modern Nazism are eager to exploit what they see as a constituency of young, tech-savvy white people whose online culture is a neat fit for them. 4chan’s “trolling” culture is built on a perverse ideal that prizes the use of offensive speech and borderline criminal behavior as a means of becoming a stronger, superior person. If you are ever offended by something, hurt by it, or made to fear for yourself, you’re weak, a “special snowflake” who’s been “triggered” and a “lolcow” (someone you should keep hurting because their reactions will be funny). In this ethic, all emotion (except rage, lust, or mirth) is weakness, something the troll can exploit to get big laughs for him and his fellows. This notion has been exploited to great effect by people like Breitbart editor Milo Yiannopoulos, who believes “America needs more trolls.” Yiannopoulos, who himself has a history of sympathy for Nazi ideas, and who has tried to lend respectability to Richard Spencer—calling him a “bright” “intellectual” figure on the “alt-right”—has since taken 4chan on the road, so to speak, using his university speaking engagements to gin up mob harassment of transgender students. Unable to resist a photogenic Nazi, the press has treated Yiannopoulos to numerous interviews. In one with the New York Times he literally said: “I don’t have feelings.” While this is an obvious lie, it fits with the troll culture ethos he seeks to promote. The ideal man — the Trollermensch, if you like — is one who does not feel, who sociopathically wounds without empathy, who finds humor in even the most grotesque of suffering. In exchange, you feel no pain, no vulnerability; you cannot be hurt the way you are ruthlessly hurting others. This is the alluring promise that 4chan’s culture has made to a generation of disaffected young men who feel powerless, adrift, and vulnerable in a rapidly changing world where being a white man is no longer a guarantee of success and prestige. Be mighty, hurt others, never get hurt again. But humanity, in all its little frailties, always catches up with us in the end. After he was punched, Richard Spencer told the Times, “I am more worried about going to dinner on an average Tuesday because these kinds of people are roaming around,” adding on a Periscope video that “I’m afraid this is going to become the meme to end all memes, that I’m going to hate watching this.” Spencer, who was proudly touting and retweeting 4chan Pepe memes and cheering right along with Yiannopoulos about the world needing more trolling, was expressing fear and vulnerability. The facade had cracked; he was no Trollermensch, just human, equal to everyone he thought himself superior to, equal to everyone he’d see dead. Nazis have long depended on something like trolling culture to work their dark magic. The concept of the “Big Lie” is right at home in an age of ideologically-driven 4chan hoaxes targeting women and minorities, and Nazism always relied on a certain chicanery to keep people guessing about their true intentions until it was too late — an eerie lesson for the present. Nazism’s fakery, and its ability to distort reality until ordinary people could not trust their own senses, bears more than a passing resemblance to 4chan’s culture of harassment and thuggish hoaxes. But the weak point was always the mythology of superiority and strength. Deploying force against Nazis always revealed the lie that they belonged to a “Master Race.” And this was not just military force, mind you, but the rolled-up sleeves and bared fists of ordinary citizens who were determined to prevent the spread of fascism’s cancer. 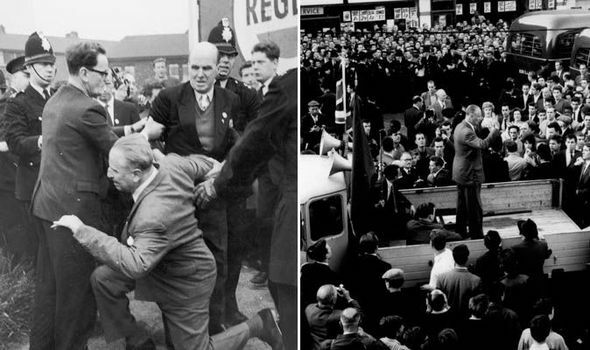 To look at British fascist leader Oswald Mosley disheveled after his rally was shut down by angry East End workers in July 1962 is to look not on the leader of a Master Race, but something considerably more ordinary and pathetic. The vulnerability of Nazis cannot be revealed through debate — many thinkers who lived through the Second World War, from Karl Popper, to Hannah Arendt, to Jean Paul Sartre, have been quite clear about why dispassionate discourse with men like Richard Spencer is not only pointless, but actively dangerous. That alone justifies Richard Spencer being punched in the face on camera.